Make your road trip extra special with a deluxe picnic basket packed just for the two of you. Take a little break from your drive and have a romantic meal along the way. Enjoy selections of artisan & house prepared lunch foods including: sandwiches, salads, fruit, sparkling water, and house baked goods. Take a look at all the packages & specials we offer and enhance your trip the way you like! A road trip for two might be the perfect place to pop the big question! On the way to Taos, keep an eye out for the perfect spot and pull over when you find it. Turn your vacation at our Santa Fe bed and breakfast into an engagement celebration with a romantic add-on or even our special elopement package if you’re ready to tie the knot in New Mexico! The Pueblo of Nambé, home to one of the most spectacular natural waterfalls in the southwest, is situated in the foothills of the Sangre de Cristo Mountains, and encompasses nearly 20,000 acres of high desert landscape. Nambe, originally “Nanbe”, meaning round earth, is one of six Tewa-speaking pueblos of Northern New Mexico. In 1977 the Pueblo opened the Nambé Falls Recreation Area to visitors for day hikes, picnicking, and overnight camping. This small village is located 25 miles north of Santa Fe in the Sangre de Cristo Mountains. This quaint northern New Mexico town is also the home of the famous Santuario de Chimayó (a National Historic Landmark). The church built from 1814-1816 remains a pilgrimage destination for devoted Christians each Holy Week who attribute the red clay of the Santuario with miraculous powers of healing. Even today, each Easter tens of thousands of people walk to the Santuario, some from hundreds of miles away. Over the years, the pilgrims who came would leave with vials of holy water, buckets of holy dirt and sacks of the famous local chile. Today Chimayó is famous for the weavings of the Ortega and Trujillo families and Rancho de Chimayo Restaurant. Along the scenic High Road to Taos lies the village of Truchas. Venturing through this ridge top village (continuing past the turn to Taos), provides an opportunity to view the village’s well-preserved history. The original adobe homes are woven tightly along the curved road, and outside the general store, still in operation, a few old gentlemen gather to share the local news. The village’s beauty and simple way of life have, over the last 20 years, attracted various artists to the region. Prominent galleries include: Hand Artes Gallery, Cardona-Hine Gallery, and Móntez Gallery. Robert Redford filmed The Milagro Beanfield War in Truchas. A rolling mesa at the base of the Sangre de Cristo Mountains, Taos, population 5,700, has a magical quality. Like Santa Fe its majestic mountains and unique blend of cultures – Spanish, Native American and Anglo – have historically drawn artists, photographers, and outdoor enthusiasts. At the Millicent Rogers Museum, four miles north of Taos, visitors can enjoy an outstanding historical collection of Native American jewelry, ceramics, paintings, and weavings, as well as Hispanic textiles, metalwork, sculpture, and a wide range of contemporary Southwestern art. The original collection was amassed by Standard Oil Heiress Millicent Rogers and has been expanded to include Hispanic secular and religious arts and crafts from colonial to current times. Museum hours and information can be found on their website. The Taos Pueblo, about a mile North of Taos, is an ancient pueblo belonging to a Tiwa-speaking Native American tribe of Pueblo people. 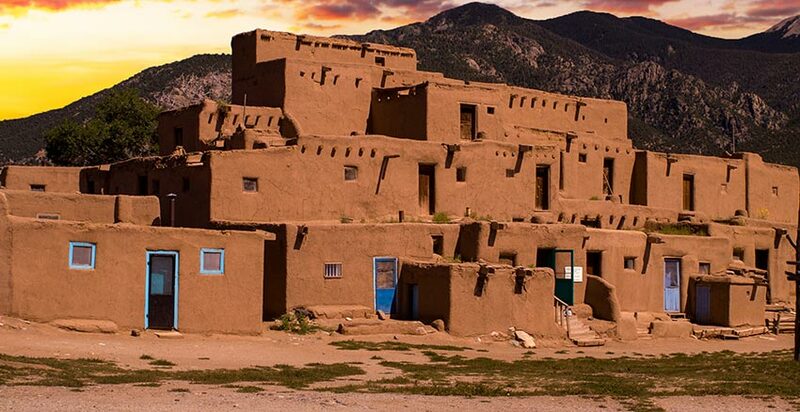 At approximately 1000 years old, the pueblos are considered to be one of the oldest continuously inhabited communities in the United States and is designated both a World Heritage Site by UNESCO and a National Historic Landmark. The pueblo is still home to hundreds who maintain the traditional cultural beliefs of their ancient society. Check out their website for schedule of tours, dances and ceremonies open to visitors. Travel west on US Hwy 64 to reach the Rio Grande Gorge Bridge, the second highest bridge on the U.S. Highway System. The bridge is a three-span steel continuous-deck-truss structure with a concrete-filled steel-grid deck. It was called the “bridge to nowhere” while it was being built because the funding did not exist to continue the road on the other side. Parking is available adjacent to the bridge and walking to the middle of the span offers great views of the Rio Grande Gorge with the Taos Mountain in the background. The D.H. Lawrence Ranch, also known as the Kiowa Ranch, is located in San Cristobal, New Mexico, approximately 20 miles north of Taos on NM522. The ranch is a 4.2 mile drive on Lawrence Ranch Road from NM522. The Ranch was the New Mexico home of the English novelist D. H. Lawrence for about two years during the 1920s. After Lawrence’s death, Frieda returned to the ranch and lived there, building a memorial building and tomb for DH in 1934. At her death in Taos in 1956, Frieda was buried at the memorial site and she bequeathed the Ranch to the University of New Mexico in Albuquerque. Her grave is located just outside the Memorial building. The ranch is open to the public on Mondays, Thursdays and Saturdays from 10 a.m. to 4 p.m. Returning from Taos via NM 68 (The Low Road) you travel along the Rio Grande for part of the journey. Traveling the Low Road visitors can experience New Mexico’s northern wine & distillery trail. This includes Blue Heron Brewing Co. & Winery in Embudo, Vivac and La Chiripada in Dixon, Black Mesa in beautiful Velarde, Estrella Del Norte less than a mile east on NM 503, and Don Quixote Distillery & Winery in Pojoaque. All have tasting rooms featuring their offerings and other gifts.